I finally got into Black Coffee at Newtown. What an awesome (and very Wellie) place! The coffee is Havana, and the food ranges from toasties to ginger ‘dead’ men if you’re just after a sweet bite with your coffee. There are a couple of pinball machines, ever-changing art exhibitions, a small music ‘shop’ at the rear, and oodles of groove. A place one could wile away a good chunk of time I should think. There’s not really much more to say other than get thyself to Newtown. 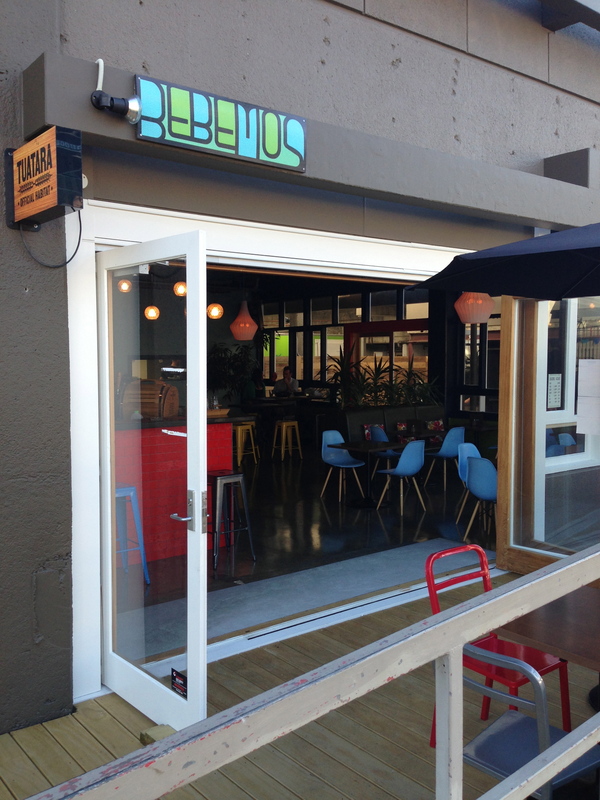 I recently stumbled into Medifoods at Newtown (the Mediterranean Food Warehouse) and was surprised to find it a rather appealing trattoria now, with the deli section tucked down the back. Apparently this happened a good six months or so ago. The menu covered such delights as Carpaccio Bresaola D.O.P (cured top round of beef, rocket, lemon marinated tomato, Granny Smith Parmigiano Reggiano), Proscuitto Di Parma (with butter and sage asparagus, fried egg and grana padano shavings), and a range of brushette, pastas, risottos, mains and desserts. With a decent selection of wines alongside. And a cabinetful of food or gelato for quick dashes or afters. Goodness! Since it was kinda still lunchtime I decided to try their $10 weekly lunch special, which turned out to penne pasta with truffle cream and rocket. I found it to be al dente, generous in size and satisfying. I also spied a pizza going out from the wood-fired oven and nearly drooled. I am so going back real soon (for the ricotta, rocket and toasted walnut gnocchi; and the asparagus, peas and smoked salmon risotto; and the pear and chocolate cake with raspberry and merlot sorbet; you get my drift….). And that was before checking out the deli products. If only I had the car…. Medifoods make all their pizzas, pastas, toppings, breads, etc in-house and pride themselves on fresh, authentic and seasonal. They also have an interesting brunch menu with options like homemade carrot and banana bread with almond and vanilla mascarpone and preserved Spanish peaches; or poached eggs on sourdough with fried halloumi cheese, grilled tomato and mashed avocado. I’m clearly going to have to walk this way often! The staff were all very friendly and helpful, and there’s pleasure every which way you look at Medifoods. It would be very easy to wile away a couple of hours if time permitted. And if that isn’t enough, check this out….. A little a’la’Pickle Jar. Trattoria – Monday to Saturday 8am to 10.30pm; Sunday 9am to 10.30pm. Deli – Monday to Saturday 8am to 8pm; Sunday 9am to 8pm. 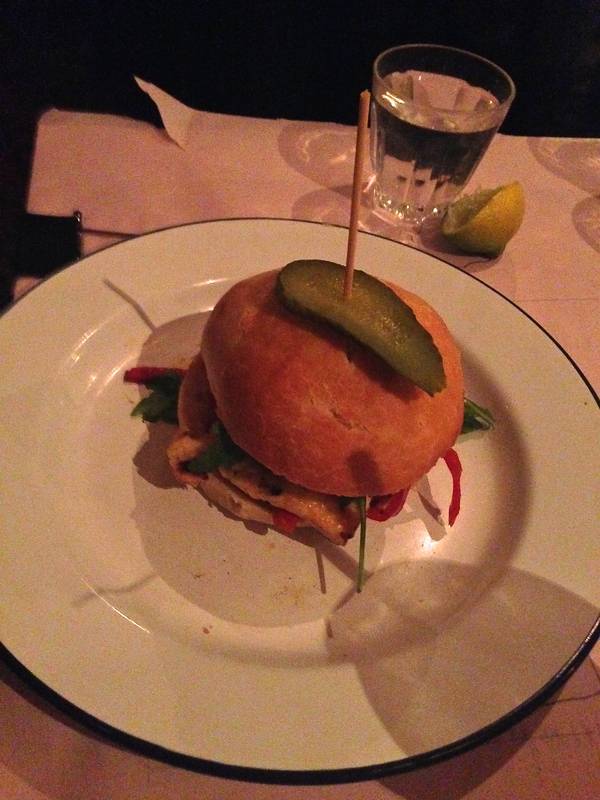 On an unexpectedly free evening, we decided to tootle along to Bebemos at Newtown. I had heard of this new South American Bar in connection with Little Beer Quarter (an owner in common I believe), and a bit of googling suggested an interesting range of craft beers, a few Argentinian wines, and a mix of South American foods (primarily Brazilian). He had a couple of different tap craft beers, and I chose the one apple and elderflower cider they turned out not to have currently, so reverted to a simple ginger beer (having had a three-course wine matched lunch earlier in the day already!). The tapas to share as a starter turned out to be more generous than expected (and tasty), so we were clearly not going to make it all the way through the menu this time (doh – the dulce de leche ice cream sundae will have to await another occasion). 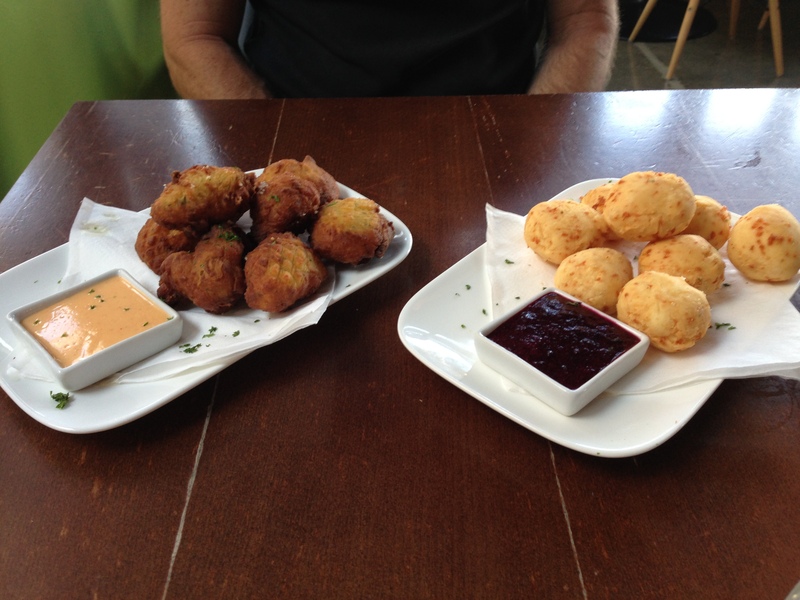 The tapas shared were pao de queijo (baked Brazilian cheese puffs served with acai relish) and crispy Brazilian rice bolinhos with parmesan & chili mayo. To follow was the Gaucho burger (beef, cheese, lettuce, tomato and chimichurri) served with rosemary and garlic fries for him, and steak and cheese empanadas for her. I particularly liked that the empanadas were hand made and irregular, with a delicious pastry both firm and melt-in-the-mouth tender (not chewy). Nice. 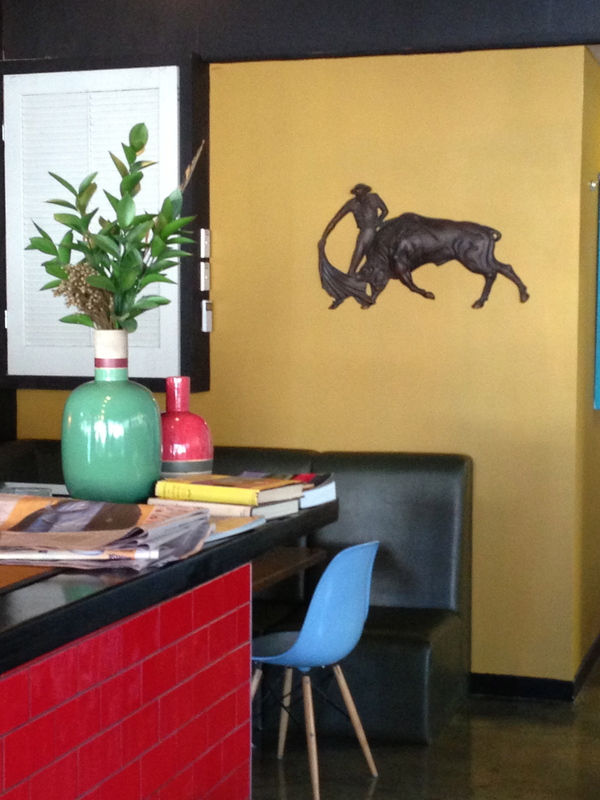 The decor is welcoming, with both indoor and courtyard dining. Staff were friendly and welcoming, although there was a tiny feel of still being new and not having hit a rhythm yet. I will definitely pop into Bebemos for a beer and tapa again if in the neighbourhood. Corner of Riddiford and Hall Streets, Newtown (at the first intersection just past the public hospital).